A whole new webpage has been added to the website of the Brussels Brontë Group. On our Picture Gallery page, you will discover a new album, called Old Prints & Lithographs. 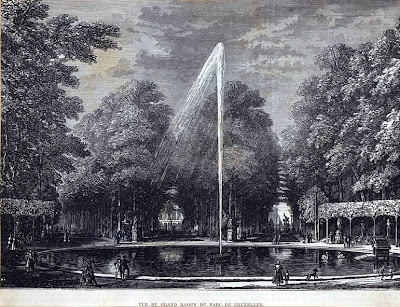 It consists of several pages, showing wonderful images of Brussels and the surrounding area of the 1830’s and 1840’s. Some you may never have seen before. If you have not yet seen all of our other pages, don’t forget to have a look; it has really interesting information on other historical themes, such as Brussels in the mid 19th Century and information on Charlotte and Emily Brontë, the Heger family and the Brussels novels; all with wonderful illustrations. Have a pleasurable exploration! The 'Grand Bassin' in the park. I stumbledupon it ;) I'm going to revisit yet again since I book-marked it. Money and freedom is the best way to change, may you be rich and continue to guide others. I do write in my diary on a daily basis. I'd like to start a blog so I will be able to share my own experience and feelings online. Please let me know if you have any recommendations or tips for new aspiring bloggers. Thankyou!